Ripe For Revival – 1928 Edition | THAT'S ENTERTAINMENT! Welcome to the start of a new week on THAT’S ENTERTAINMENT! Following our last three entries on the best forgotten Gershwin shows, today begins a 15-week series on forgotten musicals that are ripe for reviving! Each Monday for the next 15 weeks, we’ll be covering a different show from the years in between two landmarks — Show Boat (1927) and Oklahoma! (1943). This period, the years immediately preceding the “Golden Age”, encompasses the entirety of the Great Depression, and represents an oft maligned period of the American musical’s history. Many of the shows from this era are considered unworthy of reviving because, despite electrifying scores by some of the best composers Broadway has ever known, their comparatively trivial books could only be carried by the unique and dynamic stars of the era. But such thinking only deprives theatre goers of the musical thrills that once helped make Broadway the landmark that it is today. These shows are worth it. The musicals that I’ll be covering over these next 15 weeks deserve re-examination. They deserve to be seen again. Let’s start with the first year after Show Boat … 1928! This extravagant musical comedy was produced by none other than Florenz Ziegfeld himself. With a score by popular songwriters Walter Donaldson and Gus Kahn, and a book by William Anthony McGuire adapted from a play by Owen Davis, the original production starred Eddie Cantor, a former vaudevillian and Ziegfeld Follies regular, and Ruth Etting, a well known torch singer. 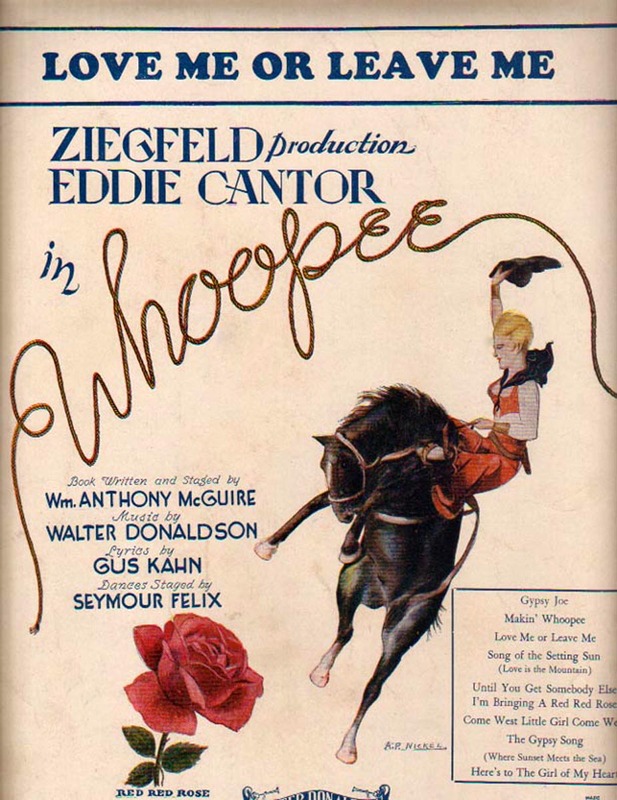 In Whoopee!, Cantor played Henry Williams, a mild-mannered hypochondriac. 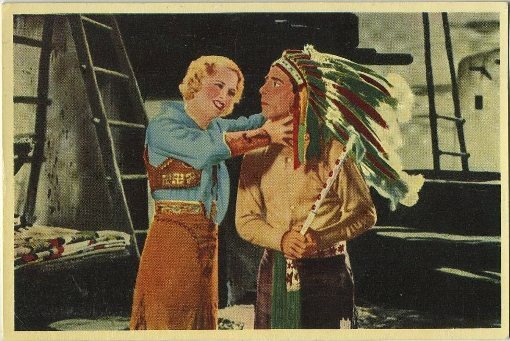 Trouble starts when Henry gives a ride to Sally Morgan (Frances Upton), a rancher’s daughter who deserts her sheriff fiancé, Bob, (Jack Rutherford) to be with Wanenis (Paul Gregory), a half-breed Native American. Thinking that Henry and Sally have eloped together, Bob, and Henry’s nurse and love interest, Mary (Ethel Shutta, replacing Ruby Keeler), chase the duo to Wanenis’s reservation. Also along (to sing a hit song) is Leslie Daw (Ruth Etting), a movie star with no real connection to the plot. Lavishly produced with a slew of great performers — Buddy Ebsen was in the ensemble — Whoopee! was a major hit. Other notable songs from the score include the beautiful “I’m Bringing A Red, Red, Rose” and Ethel Shutta’s (you might know her as Hattie in the original 1971 production of Follies – the Sondheim one) big number, “Stetson”, a fun ditty in praise of Stetson hats. Cantor also had a spot near the end of the first act where he did his famous singing waiter routine. And one of my favorite Donaldson-Kahn songs is Henry and Sally’s simple and ear-catching “Until You Get Somebody Else.” Hell, every song from this score is simple and ear-catching! The show was adapted for the screen in 1930 with Cantor, Shutta, Gregory, and Rutherford, and most of the original score. Some new Donaldson-Kahn numbers were added, including the wonderful “My Baby Just Cares For Me”, which Cantor performed in his hallmark blackface. This took the place of the singing waiter material and was a better fit. The entire film is, as of this writing, available for viewing on YouTube. Shot like a play, Whoopee! 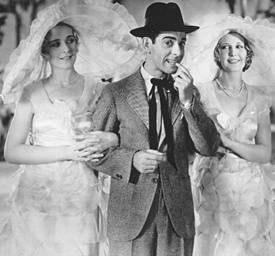 (1930) is a fascinating example of early screen musicals, and offers an excellent chance to see Cantor in one of his biggest hits. Decades later, a 1979 revival by ANTA proved fairly successful. Padding the score with even more Donaldson-Kahn songs, like “You” and “Yes, Sir, That’s My Baby”, the production was, by all accounts, a non-stop musical treat. Adjustments were made to the book. Most notable was the decision to give Mary and Henry “Love Me Or Leave Me” instead of to the miscellaneous Leslie. Even though these changes seemed to work, Whoopee! has not had a major production since. The first argument for a current revival is, first and foremost, the lively and energetic score, featuring many toe-tapping songs, only slightly less integrated here than in a show like Anything Goes (1934). Since Whoopee! was Donaldson’s only full Broadway score, interpolating his other songs into the score would also make sense — especially songs from the film, like “My Baby Just Cares For Me.” But beyond the music, Whoopee! features a solid plot with an array of diverse characters. Yes, the book needs work. The specialized Cantor stuff would have to be tinkered with. But given the success of the 1979 production, this seems possible. A greater attempt would also need to be made integrating the songs, whichever are chosen for inclusion, into the book. But even that wouldn’t be an incredible feat. Remember, this is a 1928 musical – a period piece. An audience will accept periodic breaks from the action if and when a musical moment is as entertaining as it should be. That’s part of a show like this’ charm. What’s not part of its charm is Cantor’s blackface routine. I’m not sure how it was handled in the ’79 production, but it would most certainly need to be excised in a modern production. Perhaps further alterations to the depiction of Native Americans in the book would be appropriate too, but I’m sure something could be worked out. All these revisions would be made worth it by the audience’s engagement in the show’s incredible music and rollicking story. With opportunities for large sets, dazzling costumes, and spectacular dances, a Whoopee! revival would offer a unique chance to hear this top drawer score, and could be an excellent idea for a Broadway in need of some fun. Come back next Monday for a 1929 show that’s Ripe For Revival! And tune in tomorrow for the best episodes of The Lucy-Desi Comedy Hour!